New Delhi [India], May 13 (ANI): Indian wrestler Bajrang Punia (65 Kg), who clinched the gold medal in the Asian Wrestling Championship Finals on Saturday, said the medal was due to the blessings of people and to his coaches. "Won gold due to blessings of the people and our coaches worked really hard with us," Punia told media. 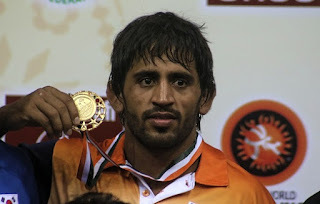 Bajrang defeated Lee Seungchul of South Korea by a score of 6-2. Earlier, Indian wrestler Sarita Mor (58 kg) also bagged a silver medal in Asian Wrestling Championship Finals on Saturday. The 23-year-old had earlier fended off a challenge from Kim Kukgwang of North Korea 3-2 to enter the finals. Whereas, Mor lost the final round to Tynybekova Aisuluu of Kyrgyzstan from 0-6. Sarita moved to the finals after defeating her Vietnamese opponent Thi Huong Dao 12-0 (technical fall) in the last-four clash. Earlier, Rio Olympic bronze-medallist Sakshi Malik had to settle for a Silver after losing against Risako Kawai of Japan by 0-10 in the gold medal match of the 60 kg category. Meanwhile, another Indian wrestler Vinesh Phogat had also lost her gold medal match against Sae Nanjo of Japan, going down 4-8 to in freestyle 55kg finals. Ritu Phogat also settled with a bronze medal in the 48kg category in women's wrestling.